Take this medication by mouth with food as directed by your doctor, usually 1-3 times daily. If you take this medicine once daily, take it with your evening meal. Taking niacin on an empty stomach increases side effects (such as flushing, upset stomach). The dosage is based on your medical condition and response to treatment. Generally, your doctor will start you at a low dose and gradually increase your dose in order to minimize side effects. Your dose will need to be increased slowly, even if you are already taking niacin and are being switched from another niacin product (such as extended-release) to this product. Follow your doctor's instructions carefully. What conditions does Niacor treat? Flushing of the face and neck along with warmth, headache, itching, burning, sweating, chills, or tingling may occur within 20 minutes of taking this medication. Flushing may persist for a few hours after use. These effects should improve or go away as your body adjusts to the medication. Dizziness, stomach upset, heartburn, nausea, vomiting, and diarrhea may also occur. If any of these effects persist or worsen, tell your doctor or pharmacist promptly. Tell your doctor right away if you have any serious side effects, including: severe dizziness/fainting, fast/irregular heartbeat, severe headache (migraine), unusual joint pain, swelling of legs/arms, vision problems, severe stomach/abdominal pain, black stools, easy bruising/bleeding, unexplained muscle pain/tenderness/weakness, persistent nausea/vomiting, signs of kidney problems (such as change in the amount of urine), dark urine, vomit that looks like coffee grounds, yellowing eyes/skin. List Niacor side effects by likelihood and severity. Before using this medication, tell your doctor or pharmacist your medical history, especially of: very low blood pressure, alcohol use, bleeding problems (such as low platelets), diabetes, gallbladder disease, glaucoma, gout, heart disease (such as recent heart attack, unstable angina), kidney disease, liver disease/increase in liver enzymes, untreated mineral imbalance (low phosphate levels), history of stomach/intestinal ulcers, underactive thyroid (hypothyroidism). What should I know regarding pregnancy, nursing and administering Niacor to children or the elderly? Some products that may interact with this drug include: "blood thinners" (such as acenocoumarol, warfarin). Does Niacor interact with other medications? 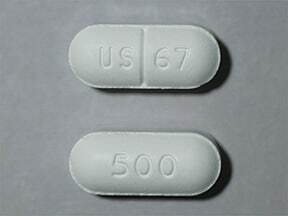 This medicine is a white, oblong, scored, tablet imprinted with "US 67" and "500". Are you considering switching to Niacor? How long have you been taking Niacor?